What you tell your customers, is your story. What they say about you, is your Reputation. As technology improves and search engines become more accurate, online reputation marketing strategies must grow and evolve. With Google changing the rules of the game . . . no longer can your company solely rely on SEO to bring your business listings to the front page of online search engine results. Google, Yahoo & Bing have now started incorporating reviews into search engine results. A business with reviews will receive preferential placement over a business with no reviews. This knowledge is central to anyone who seeks to systematically improve their online reputation marketing strategies. Your reputation is the foundation of your business. 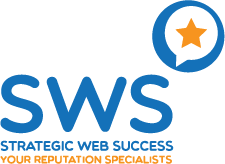 SWS can help you build your online reputation the correct way; with real customers & real reviews. This foundation is what supports your growing business & client relationships. SWS offers you simple ways to collect reviews and feedback using customised feedback/review pages, methods to contact past satisfied customers to collect their feedback/reviews, a custom media centre with ready-to-print marketing materials and much, much more. Administration, Systems & Reports. Every business needs continous care, maintenance & a watchful eye. SWS puts in place systems and reports that continuously monitor your online reputation. This means that you will receive regular updates & alerts to reviews posted online on major review sites. This helps protect reputation and helps retain existing clients. Your Positive Reputation is the most powerful marketing strategy to use. We market genuine positive reviews that showcase your business, highlighting your best business attributes to your potential clients. This is tailor-made to each business based on their industry type. Train by culture, education and inspiration. Culture impacts how your brand is perceived, online and offline. While it may be the employees as a whole who create culture, your brand reputation is determined by customers and clients. We educate & train your team to obtain & promote online reviews, as well as the necessity of providing an excellent customer experience, leading to higher customer loyalty and increased word-of-mouth referrals. We initiate kick starter meetings, monthly reviews and constant training. Consumers look up an average of 10 reviews before making a decision for a product or service. This means that your potential customers are looking at review sites such as Facebook, Google, TripAdvisor, BrownBook, Scoot, Yell.com, etc. to aid them in their search to find just about everything: health care providers, restaurants, home loans, piano tuners, plumbers, web designers, wedding planners, financial planning… (you get the drift). Equally important to what your customers are saying about you is what they are not saying. Error: Error validating access token: Session has expired on Friday, 01-Feb-19 07:08:53 PST. The current time is Tuesday, 23-Apr-19 20:56:47 PDT.